Strange Fictions Press, 9780692588604, 232pp. No matter how much Dara tries to keep a foothold on the past, she can't ride away from her own destiny. In the first book in this modern teen fantasy adventure series, sixteen-year-old Dara Adengard would rather read graphic novels than do her homework and prefers the freedom of skateboarding to the restrictions of life with her military father. Stung by the recent death of her mother, Dara conceals her mom's picture under a square of grip tape on her skateboard. But no matter how much Dara tries to keep a foothold on the past, she can't ride away from her own destiny. One evening, she discovers a silver and gold armlet with mysterious powers in the shadowy water of the swimming pool. Moments later, she is stunned to find that someone's broken into her apartment, her father has vanished, and a dead body lies sprawled in the courtyard. Evading the police, Dara escapes on a perilous quest for her father, begins to uncover her mother's hidden past, and starts to realize the shocking truth about herself. Filmed secretly while using her newfound magic armband, Dara soars to sudden fame on the wings of a YouTube video that shows her like a shaman, using the armband to heal her handsome friend Diego of a gunshot wound. When the video goes viral, Dara is propelled from homeless runaway to worldwide sensation. 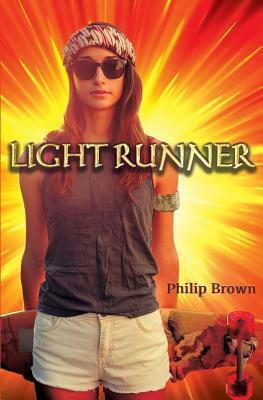 Light Runner is the first installment in this fast-paced and gripping contemporary young adult fantasy series for teens. Dara is a brave and clever female protagonist, learning to sidestep the temptations of both magic and fame. Set in the back streets of Los Angeles, Light Runner is an engaging new age fantasy for boys and girls alike. If you like action, adventure, and magic - with a hint of teen romance - you'll love Light Runner..
Stay tuned for the next installment, Light Guardian, coming in 2018.